I have always shied away from the mainstream. Being stuck in the habitual patterns of should and shouldn’t kept me in denial as a child. Until, one day, I snapped. I realized I was not, and never would be, a conformist. I had to relinquish my plans, my relationships, my obligations – even the notion of myself. Losing myself, I started to find the true me. I could no longer stay in the city where I was born. I needed freedom. So I fled my surroundings, my homeland, immigrated to another country, then another one – until I realized again that being tied to just one place, restricted by the everyday, stifled me. So I undertook a bold move. From a sedentary yogi, I became a neo-nomad. As a yoga master with over 40 years of experience I had students already on the path, ready to follow me. Instead of inviting them to study in a studio or a center, I offered them a University on Wheels. I gathered all the knowledge, experience, research, and investigation into esoteric traditions and spiritual science into the Qi-Yo Multiversity on Wheels and began to travel. More knowledge came in. Deeper insight, shamanic mysteries, divine revelations gathered through anthropological expeditions and spiritual travel followed. I was growing my esoteric library from within, nurturing my inner nature, and serendipitously touching the lives of those who crossed my path. If we station ourselves in the same beliefs and conform to the same status quo, we rob our intrinsic nature of its true brilliance. Uprooting ourselves, leaving our homes, our expectations and our demons, we are free to be – free to express ourselves, free to share our wisdom with like-minded beings. No wonder there is a renaissance in neo-nomadism today. People don’t wont to be bound by norms, rules, regulations, restrictions, borders and boundaries. They want to experience the totality of their own being: unleashed and wild, imperfect and authentic. 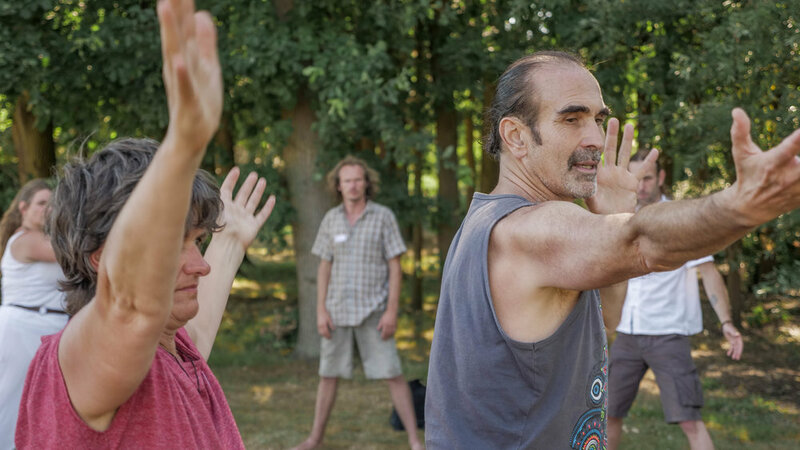 My Qi-Yo Multiversity offers that unique experience to those who want to travel spiritually, to learn about diverse wisdom traditions, and to experience them directly. Conducting teacher-training programs at powerful sites is astounding, and cathartic. Students are stirred out of their habits. They are shaken, purged, transformed. As urban nomads, we have the right to leave our box, to relinquish our limited notion of belonging and self, to come into a space of quintessential belonging and pertinence to all. I call it radical inclusivity. We have the right to work and live beyond borders – and we are remapping the world’s atlas here and now. It is our dedicated work and pure intention to invite others on an inner pilgrimage toward the soul. Only when we weed out the unnecessary restrictions can we feel the divine presence within. Qi-Yo Multiversity on Wheels gives all people the liberty to play, educate, and exchange ideas and visions. Creating that virtual tribe, we extend a bridge to all cultures, all traditions, all races and ethnicities – celebrating unity in plurality on all levels and within our cells. Yes, neo-nomadism is a cellular reboot. We defy the gravity of our cells and elevate our collective awareness into the realm of multiple identities. That is when we exit our comfort zone and face the inconvenient truths about ourselves. That is when all the challenges scattered along our way become opportunities for inner growth. That is when all stumbling blocks turn into stepping stones – opportunities for ascension and expanded consciousness. The Qi-Yo Multiversal Tribe is a roving movement of seekers, artists, visionaries, scholars, and teachers that invites all on a quest for your true, higher self. Immersing oneself in the indigenous cultures from across the globe, you are exposed to an ever-growing library of knowledge and experience, never confined by your frame of mind, where you’re never restricted in your visions, never inhibited in your relationships. Join the Qi-Yo Multiversity ride. Your mind will relinquish judgments. Your soul will intuit the course. Your spirit will steer you. The goal is your self. Are you ready to come aboard?